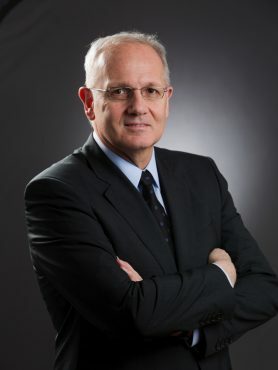 Since 2013, Jean-Yves Le Gall is President of the Centre National d’Etudes Spatiales (CNES), the French space agency. He is Chair of the administrative board of the European GNSS Agency, co-Chair of the Council of the European Space Agency (ESA) and President of the International Astronautical Federation (IAF). Founded in 1961, the CNES is the government agency in charge of shaping and implementing France’s space policy in Europe. Its task is to invent the space systems of the future, bring space technologies to maturity and guarantee France’s independent access to space. CNES is a pivotal player in Europe’s space programme and a major source of initiatives that aim to maintain France and Europe’s competitive edge. It conceives and executes space programmes with its partners in the scientific community and industry and is closely involved in many international cooperation programmes which are key to any far-reaching space policy. Through its ability to innovate and its forward-looking vision, CNES is helping to foster new technologies that will benefit society as a whole, focusing on access to space, civil applications, Earth, environment and climate, space sciences and preparing the future, security and defence. Born in 1959, Jean-Yves Le Gall is a qualified engineer and scientist who has devoted his entire career to the European space programme. He holds the rank of Commander of the National Order of Merit and Officier de la Légion d’Honneur in France. He has also been awarded the Order of Friendship by the Russian Federation and the Order of the Rising Sun, Gold and Silver Star, by the government of Japan.